Benetti grew up a White Sox fan and says calling the team's games sometimes feels surreal. He joins “Chicago Tonight” to talk about how he keeps his adrenaline in check, balances a busy schedule calling other games for ESPN and how having cerebral palsy has taught him empathy. It’s a dream job, no doubt about it. But Benetti works hard to keep his cool while calling games for the team he grew up rooting for. 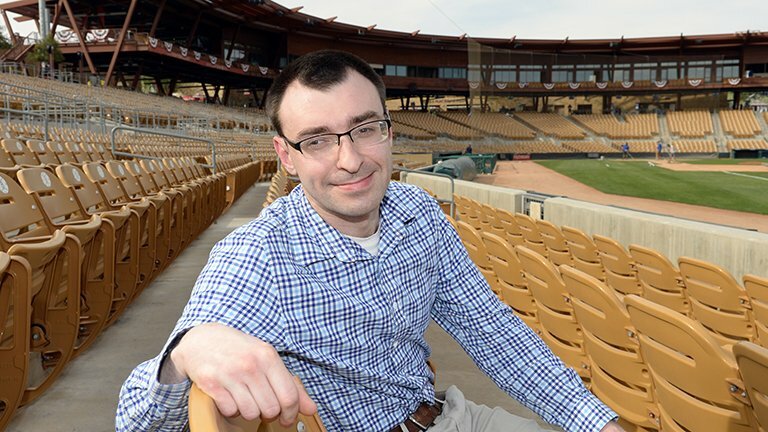 This year marks Jason Benetti’s first season as play-by-play TV announcer for most White Sox home games. This year marks Benetti’s first season as play-by-play TV announcer for most White Sox home games. Benetti, who also calls games for ESPN while the Sox are on the road, says he loves a wide variety of sports, but that there’s something special about baseball. Benetti says White Sox fans have been welcoming to a new voice on the broadcasts. And while sports fans sometimes, shall we say, lack an abundance of tact, the fact that Benetti was born with cerebral palsy hasn’t changed the way Chicagoans treat him. “I think empathy is one thing that comes along with having a disability that I’d never trade,” said Benetti. While some might see it as an impediment, Benetti says both his worldview and his work have been positively affected by cerebral palsy. Video: In this three-minute clip from "Wild Chicago," filmed in October 1990, host Ben Hollis visits the construction site of the new Comiskey Park and runs the bases. Opening Day: How Will The Sox, Cubs Fare This Season? April 4: The weather may not reflect it, but it's opening day for baseball. There's big time expectations for the long-time losing Cubs. WBEZ's Cheryl Raye Stout and Danny Ecker of Crain's Chicago Business have the stats on how the season's shaping up. March 17: Several athletes are voicing their support of Adam LaRoche’s abrupt decision to retire this week after White Sox executive vice president Ken Williams reportedly told LaRoche to limit his son’s time in the clubhouse.